those of you who are playing on our test game worlds (.com80 and .com83) may already have noticed that there have been some changes recently. 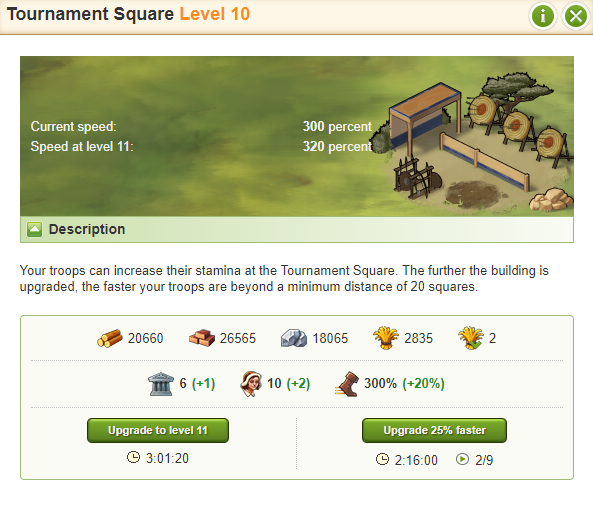 There is a new improved information interface for most buildings inside your village. With the next release, we will implement these new changes on all live game worlds! • Resource icons are now bigger and better placed. • Certain buildings have received special icons showing their eﬀect. • Improved visibility of current and next level building eﬀects. • And last but not least, all buildings will now display the total number of culture points it produces and (in brackets) the number of points next level will give. We hope that those small changes will help all players, both new players and veterans, to have a better overview of their villages and help them to plan their strategy! To arms! Best luck on the battleﬁelds!